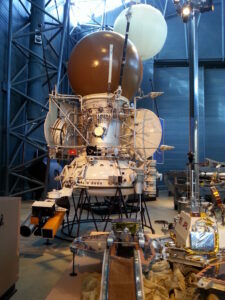 A few weeks ago, I attended the open house at the Udvar-Hazy Center of the Air and Space Museum at Dulles. As part of the open house, people were allowed to go into various restoration areas where they show how they conserve and restore various materials, including things like John Glenn’s Mercury capsule, wings and engines of World War II airplanes, Sally Ride’s flight jacket, and the model of the Enterprise from Star Trek, currently in restoration. And then there was a planetarium show! They had an inflatable dome set up. When the previous show was over, the side would unzip, people would file out, the next group would file in, and the dome would lose its integrity as air escaped the airlock, until it was zipped back up and the dome would reinflate. People sat on the floor (or on mats on the floor), and the show was a full 360 degrees on the inside of the dome. “One World, One Sky” ran about half an hour long. Big Bird is looking at the stars one night on Sesame Street, then Elmo, the red devil himself, appears, and they have a conversation about the Big Dipper. Then, Hu Hu Zhu, a blue monster from Zhima Jie, the Chinese version of Sesame Street, shows up, and the three Muppets discover that even though Elmo and Hu Hu Zhu live in different countries on opposite sides of the globe, they both have the same stars in the sky. They sing a couple of songs, like English and Chinese versions of “Twinkle, Twinkle, Little Star,” and then Elmo and Hu Hu Zhu use the power of imagination to visit the Moon. They discover that nothing can live on the Moon, and Elmo finds that he cannot fly his kite because there’s no wind. They also kick a soccer ball, and it goes reeeeally far away. Yes, it was aimed at a much younger audience than me. And, yes, I thought there were some places the program could have gone that it didn’t, such as Hu Hu Zhu and Elmo noticing that the stars are also the same on the Moon. But! “Big Bird’s Adventure: One World, One Sky” was cute, and I enjoyed it. It made the important point to children that we all share this planet. China may be far away from Sesame Street and Hu Hu Zhu may speak a different language than Elmo, but the skies they live under have the same stars. And, it inspired me to plug in a hole in my Carl Sagan collection — I ordered a copy of Sagan’s The Cosmic Connection, specifically the new edition (from 2000) from Cambridge University Press that featured new essays from Francis Drake and Ann Druyan. It arrived in the mail on Tuesday, and I didn’t have to pay an arm and a leg for it.